HONDURAS' rugged topography and lack of natural resources explain much of its history and present-day underdevelopment. The land has been underpopulated since precolonial times; the great civilizations of Middle America lay to the north, and European immigrants to the area were few in number because the region lacked mineral wealth and land suitable for farming. Extensive mountain ranges kept Honduras from being considered as a site for a transisthmian canal in the nineteenth century. This "rejection," however, brought the unexpected advantage of isolating the new nation from much of the international intrigue that engulfed Honduras's neighbors. Lack of large areas of flat land for plantations also had an unanticipated result: Honduras never produced a powerful landholding oligarchy like those that controlled the economies and politics of many of the countries of Central America, and as a result it has a more egalitarian society with a less rigid class structure than its neighbors. Honduras has frequently been exploited by outsiders. Neighbors in Central America took advantage of Honduras's weakness and repeatedly intervened in Honduran internal affairs. Countries outside the region also manipulated Honduran politics from time to time to suit their own national interests. Intervention and manipulation were not limited to sovereign states. During the first half of the twentieth century, the Honduran economy was so dominated by the export of bananas that foreign banana companies often exercised as much power as the national government. Increased nationalism and economic diversification have strengthened national institutions in recent decades, but Honduras remains a nation highly sensitive to and dependent on external forces. Although Honduras is the second largest country in Central America, it has little land available for cultivation. The terrain for the most part consists of rugged mountains, with narrow coastal plains to the north and south. Rainfall is abundant in the Caribbean lowlands and on some of the north-facing mountain slopes, but most of the arable valleys are fairly dry. When viewed from the air, most of the landscape appears barren. Unlike the more lush mountain areas of Guatemala and southern Mexico, the mountains and dry valleys of Honduras have always been rather inhospitable to settlers. Honduras lay at the southern edge of the advanced civilizations of pre-Columbian Middle America. One of the most notable indigenous groups was the Maya, whose civilization spread south from the Yucatán and Guatemala in the fifth century A.D. In what is now northwestern Honduras, the Maya built the major ceremonial center of Copán. For three and a half centuries, the city was one of the principal centers of Mayan culture and trade. Sometime in the ninth century A.D., Copán, as well as most other Mayan cities, was abandoned. The reason for this abrupt event continues to puzzle archaeologists. Theories of civil war, disease, drought, overpopulation, and crop failure have all been proposed. Whatever the cause, the fall of the Mayan civilization apparently affected only the city dwellers. Although the priests and rulers who built the temples, inscribed the glyphs, and developed the astronomy and mathematics suddenly vanished, the peasants remained in the area and form a continuum of language and culture that exist to this day. European contact with Honduras began with Christopher Columbus in 1502, but little exploration or settlement by Europeans took place for the next two decades. Spanish conquistadors and a few settlers began arriving in the 1520s, but the area soon became a battleground for competing colonial authorities. The population of the area dropped precipitously as the indigenous population was nearly wiped out by new diseases, mistreatment, and exportation of large numbers of persons to other colonies as slave labor. By 1539 only an estimated 15,000 native people remained under Spanish control; two years later this figure had declined to 8,000. Most of the indigenous inhabitants were organized into encomiendas, a system that left the native people as vassals in their villages under the control of individual Spanish settlers. The colony began to grow in the 1540s as a variety of agricultural activities developed and limited gold and silver mining began. However, gold production declined in the 1560s, the silver boom peaked in 1584, and economic depression returned shortly thereafter. By the seventeenth century, Honduras had become a poor and neglected backwater of the Spanish colonial empire, having a scattered population of mestizos (of mixed European and native ancestry), native people, blacks, and a handful of Spanish administrators and landowners. Cattle raising was the only important economic activity, and much of the Honduran interior and Caribbean coast remained uncolonized and outside effective Spanish control. The eighteenth century saw slow growth of the colony as agriculture diversified and grew and the central government increased its political control over the area. Conflict over trade policy, however, sparked a rivalry between Honduras's principal cities, León and Granada, a rivalry that eventually became a blood feud lasting for almost 200 years. In Spain, the Bourbons assumed the throne in the early years of the century, and the revitalized Spanish government made several efforts to wrest control of the Caribbean coast from the British. In the early nineteenth century, Spanish power went into rapid decline. The Napoleonic wars created turmoil in Spain, and the Spanish colonies took advantage of this diversion of attention and resources in the motherland to establish themselves as sovereign nations. In 1821 the Central American provinces joined in the growing New World chorus by declaring their independence from Spain. After some initial debate over whether Central America should face independence alone, in early 1822 the Central American provinces declared their allegiance to Mexico. The union with Mexico was brief. In 1823 the United Provinces of Central America broke free from Mexico. From its inception, however, the new federation faced a series of ultimately insoluble problems. Spanish rule had fostered divisions and local suspicions among the five provinces of the federation more than it had engendered any spirit of Central American unity. The federation was beset by constant political rivalry and fighting. Unable to maintain any form of central control, the federation dissolved in 1838, and Honduras became a sovereign state. The new nation emerged with a Spanish-indigenous heritage that survives intact to the present. Most of the population (an estimated 90 percent in 1994) was mestizo. The dominant language and religion were, and still are, Spanish and Roman Catholicism, although evangelical Protestant groups have made many converts in the late twentieth century. The largest racial and linguistic minority continue to be not the native peoples, who were almost completely eradicated or assimilated, but English-speaking blacks, a legacy of early British control of the Caribbean coast. The years after independence in the eighteenth century were neither peaceful nor prosperous in Honduras. The country's weakness attracted the ambitions of individuals and nations within and outside of Central America. Even geography contributed to its misfortunes. Alone among the Central American republics, Honduras shared land borders with its three potential rivals for regional hegemony--Guatemala, El Salvador, and Nicaragua. This national rivalry was exacerbated by political divisions and civil wars throughout the isthmus, struggles that often crossed country borders. For a century and a half after independence, Honduras was ruled by dictators and subject to a constant series of coups and coup attempts. The combined impact of civil strife and foreign interventions kept Honduras in a position of relative economic and social backwardness. The end of the nineteenth century and first decades of the twentieth century were a time of political and economic change. The peaceful transfer of presidential power in 1899 was the first time in decades that a constitutional transition had taken place. But 1899 was a watershed year in another, even more important sense. In that year, the first boatload of bananas was shipped from Honduras to the United States. The fruit found a ready market, and the trade grew rapidly. The United States-based banana companies constructed railroad lines and roads to serve the expanding banana production. Perhaps even more significant, Honduras began to attract the attention of the United States government. Until the early twentieth century, the United States played only a very limited role in internal Honduran political clashes. With its investments growing, however, the United States showed increased concern over Honduras's political instability. Although United States marines never occupied Honduras as they did neighboring Nicaragua, the United States frequently dispatched warships to waters near Honduras as a warning that intervention in Honduras was indeed a possibility if United States business interests were threatened or domestic conflict escalated. From 1920 through 1923, there were seventeen uprisings or attempted coups in Honduras. Despite an international conference and various accords to promote stability throughout the isthmus, political strife in Honduras and its neighbors increased. This instability contributed to growing United States concern over Central America. Warships were again dispatched to the western Caribbean, and political aspirants and successive governments in Honduras were urged to honor constitutional provisions and international agreements. The pressure by the United States had the desired result, and more stable governments were in power from 1925 to 1931. Political stability did not result in democracy, however. From 1932 to 1954, the country was successively ruled by two dictators-- Tiburcio Carías Andino and Juan Manuel Gálvez. Although repressive in rule, the two decades were a period of relative political calm. The administration of Carías sought to improve the military and engaged in a limited program of road building. His successor, Gálvez, continued Carías's policy of road building and developing coffee as an export crop; Gálvez also gave increased priority to education. By the early 1950s, the economy had begun to diversify. Although bananas were still the most important crop, other agricultural products, such as coffee and cotton, became significant export earners. For the first time in more than half a century, bananas accounted for less than 50 percent of export earnings at the end of the 1950s. Politically, the period from 1956 to 1958 marked a return to the instability that had characterized Honduras in the past. A coup in 1956 ousted the elected president and marked a turning point in Honduran history. For the first time, the armed forces acted as an institution rather than as the instrument of a political party or of an individual leader. For decades to come, the military would act as the final arbiter of Honduran politics. An election to return the country to civilian rule was scheduled for 1957 and won by a reformer, Ramón Villeda Morales. Although unhappy with many of his policies, the military allowed him to complete his term. When it appeared that another reformer, Ramón Ernesto Cruz, might win the 1963 elections, however, the military again seized power and installed General Oswaldo López Arrellano as president. Growing economic problems made the military regime increasingly unpopular, and except for a brief period in 1969 when the country united behind the military to fight the six-day Soccer War with El Salvador, pressure slowly built for a return to civilian government. An election was held in 1971, but after only nineteen months in power, the civilian president was again overthrown by the military. For a time, economic growth and land reform made the new military government popular. Toward the end of the decade, however, the economy again slowed, and rumors began to circulate about governmental corruption and military involvement in narcotic trafficking. By 1978 it was clear that the military was losing control of the country. A coup in 1978 replaced the military president by a three-man junta, which promised to hold elections. A new constitution was drafted, elections were held, and in January 1982, a civilian president was inaugurated. The new constitution kept the basic form of government Honduras had had under its fifteen previous constitutions. A strong president was to be elected by direct popular vote every four years. The National Congress, the unicameral legislature, was established with a varying number of members (128 in 1994) elected to four-year terms concurrent with the president. The judicial branch, theoretically independent of the other two, was in reality subject to pressure from the president and has often been criticized for corruption and inefficiency. Although democracy returned to Honduras in 1982, the continued underdevelopment of the country produced a crisis of confidence in Honduran society throughout the 1980s. Indeed during that decade, mounting economic and social pressures produced an acute sense of disorientation in Honduran society. The combination of a worldwide economic crisis, a sharp rise in crime, and the absence of an independent police force and judicial system left the average citizen with a pronounced sense of vulnerability. Three presidents--Roberto Suazo Córdova (1982-86), José Azcona Hoyo (1986-90), and Rafael Leonardo Callejas (1990-94)--had the difficult task of consolidating democracy, appeasing the military, and spurring economic development, while insurgencies raged in all of Honduras's neighbors. A campaign against leftists in the early 1980s led to frequent accusations of human rights abuses. Extensive military and economic aid came from the United States during this time, easing the effect of economic recession that enveloped all of Central America in the 1980s. The massive aid and presence of United States troops, however, evoked strong criticism from Honduran nationalists, as well as from many other segments of society, forcing the government to distance itself from the United States in the early 1990s. Honduras's fourth democratically elected president since the return to democracy, Carlos Roberto Reina Idiáquez, assumed power in January 1994. Reina, the candidate of the Liberal Party of Honduras (Partido Liberal de Honduras--PLH), one of Honduras's traditional political parties, handily defeated Osraldo Ramos Soto of the more conservative National Party of Honduras (Partido Nacional de Honduras--PNH). The 62 percent turnout for the elections was low by Honduran standards, however, and some political observers attributed the low turnout to a lack of enthusiasm among the voters for either candidate. Analysts also indicated that although the 51 percent victory for Reina appeared to be a clear mandate, many of the voters cast ballots against the unpopular Ramos Soto rather than for Reina and his policies. During the campaign, Reina ran on a traditional PLH platform of antimilitarism and social reform. In addition, he called for a "moral revolution" to combat the widespread corruption that many felt permeated Honduran society and government. His clean image and calls for reform struck a sympathetic chord with the electorate. Reina was well known to Honduran voters--the sixty-seven-year-old lawyer was a lifelong politician who had been jailed in the 1970s for opposing policies of the military government, had worked during the 1980s for international human rights organizations, and had represented Honduras on the International Court of Justice. Economic problems were the first challenge to the new president. Although the previous administration followed strict fiscal policies in its first three years in power, it went on a spending spree during its last few months. Inflation for the first two months of 1994 jumped to 16 percent, and the rapidly deteriorating economic situation forced the Reina administration to act quickly. It devalued the lempira(for value--see Glossary) from US$1=6.2 to US$1=7.3 in February, froze the price of forty-four basic foodstuffs for seventy days, and announced plans to sell state enterprises. In March 1994, Reina outlined his administration's policies in his state-of-the-union address. Social programs, especially those designed to lower the number of people living in poverty, cut the infant mortality rate, and increase child nutrition programs, would be given priority. Although the overall budget was cut 10 percent, social programs would increase to 35 percent of total government expenditures. Reina blamed many of Honduras's economic problems on corruption and urged the public and the nation's press to join him in his "moral revolution" to fight corruption at all levels. He vowed to rid the government of political appointees who did little work and promised to send a code of conduct for public employees to the National Congress for approval. Reina also promised to reduce the size of the armed forces and end the draft. In the first step of his moral revolution, Reina established a new Ministry of the Public, charged with investigating charges of corruption. Independent of the government, an additional responsibility of the Ministry of the Public was oversight of the Department of Criminal Investigation (Departamento de Investigaciónes Criminal), created to replace the much-criticized National Directorate of Investigations (Directgorio de Investigación Nacional), the special intelligence unit of the armed forces. In April a bill was submitted to the National Congress to end the military draft. Military service had been a major issue for most Hondurans because of the way recruits were obtained. Although all Honduran men are required to serve two years, draft lists were commonly ignored, and recruits were obtained by forced conscription of young, usually poor, men off the streets. The armed forces commander in chief, Luis Alonso Discua Elvir, complained that the armed forces would lack sufficient personnel if the draft (and the press-gang technique of gathering new soldiers) were abolished. In a surprise move, however, the military announced it would abide by the National Congress's decision, and the measure was eventually passed. Despite attempts to increase social spending, the overall economy continued to deteriorate throughout 1994. The largest problem, however, proved not to be government fiscal policies but rather a severe energy crisis. A nationwide drought lowered the level of water in the Francisco Morazán dam, the country's principal source of electricity. The dam was producing only half of its 300-megawatt capacity in June after one of its four generators had to be shut down. Rotating blackouts of twelve hours per day crippled industrial production. Food and fuel prices were increased in the autumn to compensate for increased transportation costs. By the end of 1994, officials of the Roman Catholic Church warned that social unrest would increase if the economic crisis continued to deepen. Although politically more stable than perhaps at any other time in its history, in late 1994 the country still faced daunting economic and social problems. The transportation and communication system was woefully inadequate for the nation's needs. Per capita income stood at US$650, one of the lowest figures in the Western Hemisphere. At least 40 percent of the total population was illiterate. Less than half the population completed elementary school. Health care for the rural population (about 50 percent of the total) and much of the urban poor was practically nonexistent. Malnutrition and disease were widespread. And despite government calls for increased spending on social programs, stringent budgetary measure presaged less, rather than more, money for government programs to improve health and education facilities. Given the grim social indicators, it is surprising that Honduras has managed to avoid, so far, the political violence that has plagued its neighbors with similar social problems. The question for Honduras in the future undoubtedly will be how best, with its limited resources, to deal with the growing pressures on its society while avoiding domestic unrest. Throughout its history, Honduras has been an underdeveloped area. Its rugged topography and lack of good ports on the Pacific coast have combined to keep it relatively isolated from the mainstream of social and economic development. The capital, Tegucigalpa, is located high in the central mountains, removed from the isthmus's main north-south transportation routes. The rugged topography and semi-isolation have provided Honduras some advantages as well as disadvantages. Unlike the neighboring republics of El Salvador and Guatemala, Honduras did not produce a totally dominant landholding oligarchy. It also escaped the turmoil over transisthmian transit routes that plagued Nicaragua and Panama. Finally, Honduras, alone among Central America's republics, is not dominated by a single city. The isolation of the capital led to the rise of San Pedro Sula in the twentieth century as the nation's commercial and industrial center. However, lack of development produced, for much of Honduras's history, relatively weak social and political institutions. Much of the nation's history has been marked by long periods of political instability, frequent military coups, and considerable government corruption and inefficiency. External powers have consistently exploited and aggravated these problems. Neighboring Central American nations have repeatedly intervened in Honduran internal affairs, giving Hondurans a strong fear of foreign attack. Countries outside the region also have manipulated Honduran politics from time to time to suit their own national interests. During the first half of the twentieth century, the Honduran economy was so dominated by the United Fruit Company and the Standard Fruit Company that company managers were frequently perceived as exercising as much power as the Honduran president. Increased nationalism and economic diversification have changed this situation in recent decades, but in the early 1990s, Honduras remained a nation highly sensitive to and dependent on external forces. Despite both national and international efforts, Honduras remained poor and vulnerable. In the 1980s, security concerns centered on the Nicaraguan border; in the early 1990s, concern centered on El Salvador because of its insurgency problems and its boundary dispute with Honduras. Both a product and a victim of its past, in the mid-1990s, Honduras was striving to find some means of gaining the benefits of modernization while avoiding the violent conflicts that wracked its neighbors in the 1980s. Pre-Columbian Honduras was populated by a complex mixture of indigenous peoples representing a wide variety of cultural backgrounds and linguistic groups--the most advanced and notable of which were related to the Maya of the Yucatán and Guatemala. Mayan civilization had reached western Honduras in the fifth century A.D., probably spreading from lowland Mayan centers in Guatemala's Petén region. The Maya spread rapidly through the Río Motagua Valley, centering their control on the major ceremonial center of Copán, near the present-day town of Santa Rosa de Copán. For three and a half centuries, the Maya developed the city, making it one of the principal centers of their culture. At one point, Copán was probably the leading center for both astronomical studies--in which the Maya were quite advanced--and art. One of the longest Mayan hieroglyphic inscriptions ever discovered was found at Copán. The Maya also established extensive trade networks spanning as far as central Mexico. Then, at the height of the Mayan civilization, Copán was apparently abandoned. The last dated hieroglyph in Copán is 800 A.D. Much of the population evidently remained in the area after that, but the educated class--the priests and rulers who built the temples, inscribed the glyphs, and developed the astronomy and mathematics--suddenly vanished. Copán fell into ruin, and the descendants of the Maya who remained had no memory of the meanings of the inscriptions or of the reasons for the sudden fall. Following the period of Mayan dominance, the area that would eventually comprise Honduras was occupied by a multiplicity of indigenous peoples. Indigenous groups related to the Toltec of central Mexico migrated from the northwest into parts of what became western and southern Honduras. Most notable were the Toltecspeaking Chorotega, who established themselves near the present-day city of Choluteca. Later enclaves of Nahua-speaking peoples, such as the Pipil, whose language was related to that of the Aztec, established themselves at various locations from the Caribbean coast to the Golfo de Fonseca on the Pacific coast. While groups related to indigenous peoples of Mexico moved into western and southern Honduras, other peoples with languages related to those of the Chibcha of Colombia were establishing themselves in areas that became northeastern Honduras. Most prominent among these were the Ulva and Paya speakers. Along the Caribbean coast, a variety of groups settled. Most important were the Sumu, who were also located in Nicaragua, and the Jicaque, whose language family has been a source of debate among scholars. Finally, in parts of what is now west-central Honduras were the Lenca, who also were believed to have migrated north from Colombia but whose language shows little relation to any other indigenous group. Although divided into numerous distinct and frequently hostile groups, the indigenous inhabitants of preconquest Honduras (before the early 1500s) carried on considerable trade with other parts of their immediate region as well as with areas as far away as Panama and Mexico. Although it appears that no major cities were in existence at the time of the conquest, the total population was nevertheless fairly high. Estimates range up to 2 million, although the actual figure was probably nearer to 500,000. European contacts with the indigenous population of Honduras began with the final voyage of Christopher Columbus. In 1502 Columbus sailed past the Islas de la Bahía (Bay Islands) and shortly thereafter reached the mainland of Central America. While at one of the islands, Columbus discovered and seized a large canoe loaded with a wide variety of trade goods. Evidence seems to indicate that the canoe's occupants were Mayan traders and that their encounter with Columbus marked his first direct contact with the civilizations of Mexican and northern Central America. Despite the fact that the canoe had been observed coming from the west, Columbus turned east and then south, sailing away from the civilizations and doing little exploring on the Honduran coast. His only direct legacy was the assigning of a few place names on the Caribbean coast, notably Guanaja for one of the Islas de la Bahía, Cabo Gracias a Dios for the eastern extremity of Honduras, and Honduras (depths in Spanish) for the overall region. The latter name suggests the deep waters off the northern coast. Little exploration took place for the next two decades. Spanish navigators Juan Díaz de Solís and Vicente Yáñez Pinzón probably touched on part of the Honduran coast in 1508 but devoted most of their efforts to exploring farther north. Some expeditions from the islands of Cuba and Hispaniola may have reached the mainland and certainly began to decimate the population of the Islas de la Bahía in the second decade of the century, but otherwise the Honduran Caribbean coast was a neglected area. Interest in the mainland was dramatically revived as a result of the expedition of Hernán Cortés to Mexico. While Cortés was completing his conquest of the Aztec, expeditions from Mexico, Panama, and the Caribbean began to move into Central America. In 1523 part of an expedition headed by Gil González Dávila discovered the Golfo de Fonseca on the Pacific coast, naming it in honor of Bishop Rodríguez de Fonseca. The following year, four separate Spanish land expeditions began the conquest of Honduras. The nearly simultaneous invasions of Honduras in 1524 by rival Spanish expeditions began an era of conflict among rival Spanish claimants as well as with the indigenous population. The major initial expeditions were led by González Dávila, who hoped to carve out a territory for his own rule, and by Cristóbal de Olid, who was dispatched from Cuba by Cortés. Once in Honduras, however, Olid succumbed to personal ambition and attempted to establish his own independent authority. Word of this reached Cortés in Mexico, and to restore his own authority, he ordered yet another expedition, this one under the command of Francisco de Las Casas. Then, doubting the trustworthiness of any subordinate, Cortés set out for Honduras himself. The situation was further complicated by the entry into Honduras of expeditions from Guatemala under Pedro de Alvarado and from Nicaragua under Hernando de Soto. In the initial struggle for power, Olid seemed to gain the upper hand, capturing both González Dávila and Las Casas. His captives, however, having managed to subvert the loyalty of some of Olid's men, took Olid prisoner, and then promptly beheaded him. Although later condemned for this action by a Mexican court, none of the conspirators ever suffered any real punishment. The arrival of Cortés in Honduras in 1525 temporarily restored some order to the Spanish conquest. He established his own authority over the rival claimants, obtained the submission of numerous indigenous chiefs, and tried to promote the creation of Spanish towns. His own headquarters was located at Trujillo on the Caribbean coast. In April 1526, Cortés returned to Mexico, and the remaining Spaniards resumed their strife. Some order was again restored in October of that year when the first royal governor, Diego López de Salcedo, arrived. López de Salcedo's policies, however, drove many indigenous people, once pacified by Cortés, into open revolt. His attempt to extend his jurisdiction into Nicaragua resulted in his imprisonment by the authorities there. After agreeing to a Nicaraguan-imposed definition of the boundary between the two provinces, López de Salcedo was released but did not return to Honduras until 1529. The early 1530s were not prosperous for Honduras. Renewed fighting among the Spaniards, revolts, and decimation of the settled indigenous population through disease, mistreatment, and exportation of large numbers to the Caribbean islands as slaves left the colony on the edge of collapse by 1534. The Spanish crown renamed the depressed province as Honduras-Higueras, subdividing it into two districts. Higueras encompassed the western part while the rest remained known as Honduras. The decline in population of the province continued, and only the direct intervention of Pedro de Alvarado from Guatemala in 1536 kept Higueras from being abandoned. Alvarado was attracted by the prospect of gold in the region, and, with the help of native Guatemalans who accompanied him, he soon developed a profitable gold-mining industry centered in the newly established town of Gracias. The discovery of gold and silver deposits attracted new settlers and increased the demand for indigenous labor. The enforced labor, however, led to renewed resistance by the native people that culminated in a major uprising in 1537. The leader of the uprising was a capable young Lenca chieftain known as Lempira (after whom the Honduran national monetary unit would eventually be named). Lempira established his base on a fortified hill known as the Peñol de Cerquín and until 1538 successfully defeated all efforts to subdue him. Inspired by his examples, other native inhabitants began revolting, and the entire district of Higueras seemed imperiled. Lempira was ultimately murdered while negotiating with the Spaniards. After his death, resistance rapidly disintegrated, although some fighting continued through 1539. The defeat of Lempira's revolt accelerated the decimation of the indigenous population. In 1539 an estimated 15,000 native Americans remained under Spanish control; two years later, there were only 8,000. Most of these were divided into encomiendas, a system that left the native people in their villages but placed them under the control of individual Spanish settlers. Under terms of the encomienda system, the Spaniards were supposed to provide the indigenous people with religious instruction and collect tribute from them for the crown. In return, the Spaniards were entitled to a supposedly limited use of indigenous labor. As the native population declined, the settlers exploited those remaining even more ruthlessly. This exploitation led to a clash between the Spanish settlers and authorities on one side and on the other side the Roman Catholic Church led by Father Cristóbal de Pedraza, who, in 1542 became the first bishop of Honduras. Bishop Pedraza, like others after him, had little success in his efforts to protect the native people. The initial mining centers were located near the Guatemalan border, around Gracias. In 1538 these mines produced significant quantities of gold. In the early 1540s, the center for mining shifted eastward to the Río Guayape Valley, and silver joined gold as a major product. This change contributed to the rapid decline of Gracias and the rise of Comayagua as the center of colonial Honduras. The demand for labor also led to further revolts and accelerated the decimation of the native population. As a result, African slavery was introduced into Honduras, and by 1545 the province may have had as many as 2,000 slaves. Other gold deposits were found near San Pedro Sula and the port of Trujillo. Although mining provided much of the limited revenue Honduras generated for the Spanish crown, a majority of the inhabitants were engaged in agriculture. Attempts to promote agricultural exports had limited success, however, and most production remained on a subsistence level. If anything, the province became more rural during the seventeenth and eighteenth centuries. As a result of economic declines or foreign attacks, several town governments simply ceased to function during this period. The cattle industry was probably the most important agricultural activity. Much of the cattle industry was on a small scale, but by 1714 six ranchers in the areas of the present-day departments of Yoro and Olancho owned over 1,000 head of cattle each. Some of the cattle were driven to Guatemala for sale. Such sales, however, occasionally produced meat shortages in Honduras and led to conflicts between Guatemalan and Honduran provincial officials. Much of the Honduran interior remained uncolonized and outside of effective Spanish control during the colonial era. The Jicaque, fleeing into the hills, managed to retain considerable cultural autonomy. Other indigenous groups, however, were increasingly brought under Spanish influence and began to lose their separate identities. This assimilation was facilitated by occasional expeditions of government and church officials into new areas. One such expedition into Yoro in 1689 found forty villages of native people living outside of effective Spanish control. By the end of the seventeenth century, governing Honduras had become a frustrating, thankless task. Only Comayagua, with 144 families, and Tegucigalpa, with 135, had over 100 Spanish settlers. The province boasted little in the way of education or culture. The lack of good ports, especially on the Pacific coast, limited contacts with the outside world. Whenever possible, the Spanish colonists forced native people to move to the Tegucigalpa area, where they were available for labor in the mines. However, illegal resettlement and corruption in the mining industry--where every available ruse was used to avoid paying taxes--created a constant series of problems for colonial authorities. Smuggling, especially on the Caribbean coast, was also a serious problem. Early in the eighteenth century, the Bourbon Dynasty, linked to the rulers of France, replaced the Habsburgs on the throne of Spain and brought change to Honduras. The new dynasty began a series of reforms throughout the empire designed to make administration more efficient and profitable and to facilitate the defense of the colonies. Among these reforms was a reduction in the tax on precious minerals and in the cost of mercury, which was a royal monopoly. In Honduras these reforms contributed to a revival of the mining industry in the 1730s. Efforts to promote the Honduran tobacco industry as a royal monopoly proved less effective and encountered stiff local opposition. The same was true of plans to improve tax collection. Ultimately, the Bourbons abolished most of the corrupt local governmental units, replacing them in 1787 with a system of intendencias (the name of the new local unit and also its administrator, a royal official who supervised tax collections and commercial matters, controlled prices and credit, and exercised some judicial functions). A major problem for Spanish rulers of Honduras was the activity of the English along the northern Caribbean coast. These activities began in the late sixteenth century and continued into the nineteenth century. In the early years, Dutch as well as English corsairs (pirates) attacked the Caribbean coast, but as time passed the threat came almost exclusively from the English. In 1643 one English expedition destroyed the town of Trujillo, the major port for Honduras, leaving it virtually abandoned for over a century. Destructive as they were, raiding expeditions were lesser problems than other threats. Beginning in the seventeenth century, English efforts to plant colonies along the Caribbean coast and in the Islas de la Bahía threatened to cut Honduras off from the Caribbean and raised the possibility of the loss of much of its territory. The English effort on the Honduran coast was heavily dependent on the support of groups known as the Sambo and the Miskito, racially mixed peoples of native American and African ancestry who were usually more than willing to attack Spanish settlements. British settlers were interested largely in trading, lumbering, and producing pitch. During the numerous eighteenth-century wars between Britain and Spain, however, the British crown found any activity that challenged Spanish hegemony on the Caribbean coast of Central America to be desirable. Major British settlements were established at Cabo Gracias a Dios and to the west at the mouth of the Río Sico, as well as on the Islas de la Bahía. By 1759 a Spanish agent estimated the population in the Río Sico area as 3,706. Under the Bourbons, the revitalized Spanish government made several efforts to regain control over the Caribbean coast. In 1752 a major fort was constructed at San Fernando de Omoa near the Guatemalan border. In 1780 the Spanish returned in force to Trujillo, which they began developing as a base for expeditions against British settlements to the east. During the 1780s, the Spanish regained control over the Islas de la Bahía and drove the majority of the British and their allies out of the area around Black River. A British expedition briefly recaptured Black River, but the terms of the Anglo-Spanish Convention of 1786 gave definitive recognition to Spanish sovereignty over the Caribbean coast. In the early nineteenth century, Spanish power went into rapid decline. Although Spain was allied with France during the Napoleonic Wars, in 1808 Napoleon Bonaparte forced the Spanish king to abdicate and put a Bonaparte on the Spanish throne. In response, Spanish people erupted in revolt in Madrid and throughout Spain, setting off a chain of uprisings in Latin America. In Honduras, resentment against rule by the exiled Spanish king increased rapidly, especially because increased taxes for Spain's struggle against the French threatened the cattle industry. In 1812 disturbances that broke out in Tegucigalpa were more linked to long-standing rivalry with Comayagua, however, than to opposition to Spanish rule. The disturbances were quickly controlled, and, to appease local discontent, the municipal government of Tegucigalpa was reestablished. The rivalry between Tegucigalpa and Comayagua helped precipitate the final collapse of Spanish authority in Honduras. A new Spanish administration attempted to transfer Comayagua's tobacco factory to Tegucigalpa. This move led to defiance by Comayagua, which refused to acknowledge the authority of the government in Guatemala. The weakened Spanish government was unable to end Comayagua's defiance, and for a time civil strife threatened to break out. Conflict was averted by the decision made by all the Central American provinces on September 15, 1821, to declare their independence from Spain. This action failed to resolve the dispute between Tegucigalpa and Comayagua, however; the former now urged the creation of a unified Central American state, while the latter favored union with the Empire of Mexico under the rule of General Augustín de Iturbide. Ultimately, Comayagua's position prevailed, and in early 1822 the Central American provinces declared their allegiance to Mexico. This union lasted just over a year and produced few if any benefits for either party. In March 1823, Iturbide was overthrown in Mexico, and the empire was replaced by a republic. The Central American Congress, in which Comayagua but not Tegucigalpa was represented, was quickly convened. With little debate, the United Provinces of Central America declared their independence from Mexico. Mexico's only effort to reverse this decision consisted in maintaining control over Chiapas, the northernmost of the six previous provinces of Central America. From its 1823 inception, the new federation (the United Provinces of Central America) faced a series of ultimately unresolvable problems. Instead of engendering a spirit of unity, Spanish rule had fostered divisions and local suspicions. In the case of Honduras, this divisiveness was epitomized by the rivalry between Tegucigalpa and Comayagua. There was even some sentiment for admitting these two cities as separate provinces within the federation, but that proposal was ultimately rejected. In addition, much of the region was suspicious of Guatemalan ambitions to dominate Central America and wished to retain all possible local authority rather than surrender any to a central government. At least equally serious was the division of the politically active population into conservative and liberal factions. The conservatives favored a more centralized government; a proclerical policy, including a church monopoly over education; and a more aristocratic form of government based on traditional Spanish values. The liberals wanted greater local autonomy and a restricted role for the church, as well as political and economic development as in the United States and parts of Western Europe. The conservatives favored keeping native people in their traditional, subservient position, while the liberals aimed at eventually eliminating indigenous society by incorporating it into the national, Hispanic culture. At the time of Central American independence (1823), Honduras was among the least-developed and least-populated provinces. In 1824 its population was estimated at just over 137,000. Despite its meager population, Honduras produced two of the most prominent leaders of the federation, the liberal Francisco Morazán (nicknamed the "George Washington of Central America") and the conservative José Cecilio del Valle. In 1823 del Valle was narrowly defeated by liberal Manuel José Arce for election as the federation's first president. Morazán overthrew Arce in 1829 and was elected president of the federation in 1830, defeating del Valle. The beginning of Morazán's administration in 1830 saw some efforts to reform and promote education. Success was limited, however, because of lack of funds and internal fighting. In the elections of 1834, del Valle defeated Morazán, but del Valle died before taking office, and the legislature offered Morazán the presidency. With clerical support, a conservative uprising began in Guatemala in 1837, and within a year the federation had begun to dissolve. On May 30, 1838, the Central American Congress removed Morazán from office, declared that the individual states could establish their own governments, and on July 7 recognized these as "sovereign, free, and independent political bodies." For Honduras, the period of federation had been disastrous. Local rivalries and ideological disputes had produced political chaos and disrupted the economy. The British had taken advantage of the chaotic condition to reestablish their control over the Islas de la Bahía. As a result, Honduras wasted little time in formally seceding from the federation once it was free to do so. Independence was declared on November 15, 1838, and in January 1839, an independent constitution was formally adopted. Morazán then ruled only El Salvador, and in 1839 his forces there were attacked by a Honduran army commanded by General Francisco Ferrera. Ferrera was defeated but returned to attack again in the summer, only to suffer another defeat. The following year, Morazán himself was overthrown, and two years later he was shot in Costa Rica during a final, futile attempt to restore the United Provinces of Central America. For Honduras, the first decades of independence were neither peaceful nor prosperous. The country's political turmoil attracted the ambitions of individuals and nations within and outside of Central America. Even geography contributed to its misfortunes. Alone among the Central American republics, Honduras had a border with the three potential rivals for regional hegemony--Guatemala, El Salvador, and Nicaragua. This situation was exacerbated by the political division throughout the isthmus between liberals and conservatives. Any liberal or conservative regime saw a government of the opposite ideology on its borders as a potential threat. In addition, exiled opposition figures tended to gather in states whose governments shared their political affiliation and to use these states as launching pads for efforts to topple their own governments. For the remainder of the century, Honduras's neighbors would constantly interfere in its internal politics. After the fifteen-month interim presidency of Francisco Zelaya Ayes (1839-40), conservative General Ferrera became independent Honduras's first elected president. Ferrera's two-year term (1841- 42) was followed by a five-year period in which he alternately named himself president or allowed the congress to name an interim president while he maintained control of the country by holding the post then known as minister of war. Ferrera's last notable act was the unsuccessful attempt to depose the liberal Morazán as president of El Salvador. In 1847 Ferrera allowed fellow-conservative Juan Lindo Zelaya to assume the presidency. Under Lindo's presidency, a new constitution was adopted in 1848, and some effort was made to promote education, but any effort to make substantial improvements in the country's situation was doomed by continuing turmoil. During Lindo's presidency (1847-52), the British began pressuring Honduras for the payment of debts and other claims. In 1849 a British naval force briefly occupied the port of Trujillo, destroying property and extorting 1,200 pesos from the local government. The following year, Lindo's own vice president revolted and was prevented from seizing power only through the military intervention of El Salvador and Nicaragua. All this turmoil may help to explain why Lindo refused an additional presidential term and instead turned over power in 1852 to the opposition liberals, headed by Trinidad Cabañas (1852-55). Three years later, the conservative government of Guatemala invaded Honduras and ousted Cabañas, installing in his place the conservative leader, Santos Guardiola. The fighting between liberals and conservatives was temporarily set aside because of the 1855 appearance in Central America of an American soldier of fortune, William Walker, who established himself as president of Nicaragua in 1856. Cabañas briefly considered seeking Walker's aid in attempting to return to power. Instead, armies from all the countries of Central America joined to oppose Walker, who was forced to abandon Nicaragua in 1857 and return to the United States. In 1859 the British agreed to a treaty that recognized Honduran sovereignty over the Islas de la Bahía. Some of the British settlers in the area objected to this transfer and appealed to Walker for help. Walker evidently thought that his return to Central America would be welcomed by the Honduran liberals, who were once again trying to oust Guardiola. Walker landed on the Honduran coast in 1860 but found little support and encountered determined opposition from both the Hondurans and the British. He surrendered to the British, who promptly handed him over to Honduran authorities. A few days later in 1860, he died in front of a Honduran firing squad. The return of the Islas de la Bahía and the death of Walker ended the immediate threat to Honduran territorial integrity, but other Central American nations continued to be involved in Honduran internal affairs. Guardiola was assassinated by his own honor guard in 1862, and the following decade witnessed the presidency change hands almost twenty times. General José María Medina served as president or dictator eleven times during that period, but Guatemalan intervention in 1876 drove him and his conservative supporters from power. From 1876 until 1882, liberal president Marco Aurelio Soto governed Honduras with the support of Guatemalan strongman General Justo Rufino Barrios. Soto succeeded not only in restoring order but also in implementing some basic reforms in finance, education, and public administration. But in 1883, he too fell into disfavor with Barrios and was forced to resign. His successor, General Luis Borgrán, survived in office until 1891 when General Poinciana Leiva (who had ruled briefly three times from 1873-76) was returned to power in a manipulated election. Although a liberal, Leiva tried to rule as an absolute dictator, dissolving the fledgling Liberal Party of Honduras (Partido Liberal de Honduras--PLH) and deporting its leaders. The result was another round of civil conflict from which the reconstituted PLH ultimately emerged victorious. The PLH was led by Policarpo Bonilla, with the support of Nicaragua's liberal dictator, José Santos Zelaya. When Bonilla assumed power in 1894, he began to restore a limited degree of order to the Honduran political scene. Another constitution was promulgated in 1895, and Bonilla was elected to a four-year term. Bonilla's administration revised civil codes, improved communications, and began an effort to resolve the long- standing boundary dispute with Nicaragua. Bonilla also ensured that in 1899, at the end of his term, he would be succeeded by his military commander, General Terencio Sierra. The combined impact of civil strife and foreign interventions had doomed Honduras to a position of relative economic and social backwardness throughout the nineteenth century. The country had remained overwhelmingly rural; Tegucigalpa, Comayagua, and San Pedro Sula were the only towns of any size. In the early 1850s, the total population was estimated at 350,000, the overwhelming majority of whom were mestizos. By 1914 the population had grown to only 562,000. Opportunities for education and culture were limited at best. Mid-nineteenth century records indicate that Honduras had no libraries and no regularly published newspapers. Two universities were maintained, although their quality was questionable. By the 1870s, only 275 schools, having approximately 9,000 pupils, existed in the entire country. In 1873-74, the government budgeted only the equivalent of US$720 for education, a sum designated for the national university. Throughout the nineteenth century, Hondurans looked to mining as a means of improving their economic position. The mining industry had fallen into severe neglect in the first decades of the century, however. Many mines had been abandoned and flooded. During the years following independence, efforts to revive the industry were generally frustrating for both domestic and foreign entrepreneurs. Effort after effort was abandoned because of civil disturbances, lack of transportation, and poor health conditions. Mining was revived somewhat in the 1880s. A key factor in this revival was the activity of the New York and Honduras Rosario Mining Company (NYHRMC), which had expanded rapidly and had become a major economic and political power within Honduras. Owing in part to the company's efforts, the Honduran government had allowed foreign mining companies to operate in Honduras with a minimum of restrictions and a virtual exemption from taxes. By 1889 the company was annually shipping bullion with a value of over US$700,000 to the United States. Profits from this operation were extremely high; the company's dividends for the first half of 1889 totaled US$150,000. The NYHRMC's success attracted other companies to Honduras, and gold and silver exports became the principal source of foreign exchange for the rest of the century. The NYHRMC's success stood alone, however; most of the nearly 100 other companies were total failures. The Yuscarán Mining and Milling Company sold over US$5 million in stock but failed to begin effective production. By the end of the nineteenth century, the brief mining boom was in decline, although the NYHRMC would remain a major factor in the Honduran economy until the mid-twentieth century. Although mining had provided foreign exchange, the vast majority of Hondurans gained their livelihoods from agriculture, usually on a subsistence level. Periodic efforts were made to develop agricultural exports, but they met with little success. Some tobacco, cattle, and hides were exported, mostly to neighboring countries. The recurring civil conflicts and the resultant confiscation of stock by various military commanders, however, put a damper on efforts to develop the cattle industry and contributed to its rather backward status. Some bananas and other fruits were exported from the Islas de la Bahía, much of this trade going to New Orleans, but the volume was small and the benefit for the rest of the nation almost imperceptible. Although the peaceful transfer of power from Bonilla to General Sierra in 1899 was important as the first time in decades that such a constitutional transition had taken place, that year was a watershed in another, even more important, sense. In 1889 the Vaccaro brothers of New Orleans, founders of what would become the Standard Fruit and Steamship Company (later known as Standard Fruit Company), shipped their first boatload of bananas from Honduras to New Orleans. The fruit found a ready market, and the trade grew rapidly. By 1902 local railroad lines were being constructed on the Caribbean coast to accommodate the expanding banana production. Sierra's efforts to perpetuate himself in office led to his overthrow in 1903 by General Manuel Bonilla, who proved to be an even greater friend of the banana companies than Sierra had been. Companies gained exemptions from taxes and permission to construct wharves and roads, as well as permission to improve interior waterways and to obtain charters for new railroad construction. Conservative Manuel Bonilla was an opponent rather than a relative or friend of Sierra's liberal predecessor, Policarpo Bonilla. During Manuel Bonilla's term in office, he imprisoned expresident Policarpo Bonilla for over two years and took other steps to suppress his political opposition, the liberals, who were the only group with an organized political party. The conservatives were divided into a host of personalist factions and lacked coherent leadership. Manuel Bonilla made some efforts to reorganize the conservatives into a "national party." The present-day National Party of Honduras (Partido Nacional de Honduras--PNH) traces its origins to his administration. Manuel Bonilla promoted some internal improvements, notably road building. He improved the route from Tegucigalpa to the Pacific coast. On the international front, he concluded friendship pacts with Nicaragua and later with Guatemala and El Salvador. Of perhaps greatest significance was the work accomplished during Manuel Bonillo's administration to delineate the longdisputed border with Nicaragua. The area, called the Mosquitia region, was located in the eastern part of the country in the department of Gracias a Dios. The area was large but virtually unpopulated except for small groups of Miskito who owed little allegiance to either nation. In 1894 a treaty provided for the establishment of a boundary commission, composed of representatives of Honduras and Nicaragua, to resolve the dispute. By 1904 the commission had been able to agree on only the lower part of the boundary. In that year, to reach agreement on the upper part, the representatives of the two nations picked King Alfonso XIII of Spain as a neutral, third member of the commission, in effect making him the arbiter. His decision, announced in 1906, gave the bulk of the disputed territory to Honduras, establishing the upper boundary line along the Río Coco. At the time, both governments accepted the decision, but in 1912 Nicaragua raised new objections. The dispute was finally resolved in favor of the 1906 arbitration only in 1960. In 1906 Manuel Bonilla successfully resisted an invasion from Guatemala, but this was his last major success. The friendship pact with Guatemala and El Salvador signed in 1906 was interpreted as an anti-Nicaraguan alliance by the Nicaraguans. Nicaragua's powerful President Zelaya began to support exiled Honduran liberals in their efforts to topple Manuel Bonilla, who had become, in effect, the Honduran dictator. Supported by elements of the Nicaraguan army, the exiles invaded Honduras in February 1907 and established a provisional junta. With the assistance of Salvadoran troops, Manuel Bonilla tried to resist, but in March his forces were decisively beaten in a battle notable for the introduction of machine guns into Central American civil strife. Until the early twentieth century, the United States had played only a very limited role in internal Honduran political clashes. Because there was not a resident United States minister in Tegucigalpa, the minister to Guatemala had been accredited for that position. The presence of the United States in the Caribbean increased following the Spanish-American War (1898), however. The decision to build a canal through Panama and expanded commercial activities led to a more active role for the United States government, as well as for United States companies. By 1907 the United States looked with considerable disfavor on the role Zelaya of Nicaragua was playing in regional affairs. When the Nicaraguan army entered Honduras in 1907 to overthrow Bonilla, the United States government, believing that Zelaya wanted to dominate the entire region, landed marines at Puerto Cortés to protect the North American bananas trade. Other United States naval units prevented a Nicaraguan attack on Bonilla's last position at Amapala in the Golfo de Fonseca. After negotiations conducted by the United States naval commander, Manuel Bonilla sought refuge on the U.S.S. Chicago, and the fighting came to an end. The United States chargé d'affaires in Tegucigalpa took an active role in arranging a final peace settlement, with which Zelaya was less than happy. The settlement provided for the installation of a compromise regime, headed by General Miguel Dávila, in Tegucigalpa. Dávila was a liberal but was distrusted by Zelaya, who made a secret arrangement with El Salvador to oust him from office. This plan failed to reach fruition, but the United States, alarmed by the threat of renewed conflict in Central America, called the five Central American presidents to a conference in Washington in November. The Central American Peace Conference of 1907 made a major effort to reduce the level of conflict within the region. A Honduran proposal to reestablish the political union of the Central American states failed to achieve acceptance, but several other measures were adopted. The five presidents signed the General Treaty of Peace and Amity of 1907 pledging themselves to establish the Permanent Central American Court of Justice, which would resolve future disputes. The treaty also committed the five countries to restrict the activities of exiles from neighboring states and provided the basis for legal extraditions. Of special interest was a United States-sponsored clause that provided for the permanent neutrality of Honduras in any future Central American conflicts. Another convention adopted by all five states committed the signers to withhold recognition from governments that seized power by revolutionary means. The United States and Mexico, which had acted as cosponsors of the conference, indicated informally that they would also deny recognition to such governments. From the point of view of the United States Department of State, these agreements represented a major step toward stabilizing Central America in general and Honduras in particular. The first test of the new treaty involved Honduras. In 1908 opponents of President Dávila, probably supported by Guatemala and El Salvador, invaded the country. Nicaragua supported the Honduran president, and war seemed imminent. Perhaps motivated by the possibility of United States intervention, however, the parties agreed to submit the dispute to the new Central American court. The court ultimately rejected the Honduran and Nicaraguan complaints, but in the meantime the revolt collapsed, thus briefly restoring peace to Honduras. Along with fighting off efforts to overthrow him, President Dávila made some attempts to modernize Honduras. He invited a Chilean officer to establish a regular military academy, which failed to survive beyond his time in office. Like his predecessor, Dávila encouraged the activities of the banana companies. The companies, however, were less than totally happy with him, viewing his administration as ineffective. In addition, rivalry among the companies became a factor in Honduran politics. In 1910 Dávila's administration granted the Vaccaro brothers a generous rail concession that included a provision prohibiting any rival line within twenty kilometers. This concession angered Samuel Zemurray of the newly formed Cuyamel Fruit Company. Zemurray had encouraged and even helped finance the 1908 invasion and was to continue to make trouble for the Dávila administration. Despite the failure of the 1908 uprising, the United States remained concerned over Honduran instability. The administration of William Howard Taft saw the huge Honduran debt, over US$120 million, as a contributing factor to this instability and began efforts to refinance the largely British debt with provisions for a United States customs receivership or some similar arrangement. Negotiations were arranged between Honduran representatives and New York bankers, headed by J.P. Morgan. By the end of 1909, an agreement had been reached providing for a reduction in the debt and the issuance of new 5 percent bonds: the bankers would control the Honduran railroad, and the United States government would guarantee continued Honduran independence and would take control of customer revenue. The terms proposed by the bankers met with considerable opposition in Honduras, further weakening the Dávila government. A treaty incorporating the key provisions was finally signed in January 1911 and submitted to the Honduran legislature by Dávila. However, that body, in a rare display of independence, rejected it by a vote of thirty-three to five. An uprising in 1911 against Dávila interrupted efforts to deal with the debt problem. The United States stepped in to mediate the conflict, bringing both sides to a conference on one of its warships. The revolutionaries, headed by former president Manuel Bonilla, and the government agreed to a cease-fire and the installation of a provisional president who would be selected by the United States mediator, Thomas Dawson. Dawson selected Francisco Bertrand, who promised to hold early, free elections, and Dávila resigned. The 1912 elections were won by Manuel Bonilla, but he died after just over a year in office. Bertrand, who had been his vice president, returned to the presidency and in 1916 won election for a term that lasted until 1920. The relative stability of the 1911-20 period was difficult to maintain. Revolutionary intrigues continued throughout the period, accompanied by constant rumors that one faction or another was being supported by one of the banana companies. Rivalry among these companies had escalated in 1910 when the United Fruit Company had entered Honduras. In 1913 United Fruit established the Tela Railroad Company and shortly thereafter a similar subsidiary, the Trujillo Railroad Company. The railroad companies were given huge land subsidies by the Honduran government for each kilometer of track they constructed. The government expected that in exchange for land the railroad companies would ultimately build a national rail system, providing the capital with its long-sought access to the Caribbean. The banana companies, however, had other ideas in mind. They used the railroads to open up new banana lands, rather than to reach existing cities. Through the resultant land subsidies, they soon came to control the overwhelming share of the best land along the Caribbean coast. Coastal cities such as La Ceiba, Tela, and Trujillo and towns further inland such as El Progreso and La Lima became virtual company towns, and the power of the companies often exceeded the authority wielded in the region by local governments. For the next two decades, the United States government was involved in opposing Central American revolutions whether the revolutions were supported by foreign governments or by United States companies. During the 1912-21 period, warships were frequently dispatched to areas of revolutionary activity, both to protect United States interests and to exert a dampening effect on the revolutionaries. In 1917 the disputes among the companies threatened to involve Honduras in a war with Guatemala. The Cuyamel Fruit Company, supported by the Honduran government, had begun to extend its rail lines into disputed territory along the Guatemalan border. The Guatemalans, supported by the United Fruit Company, sent troops into the area, and it seemed for a time that war might break out. United States mediation ended the immediate threat, but the dispute smoldered until 1930 when a second United States mediation finally produced a settlement. The development of the banana industry contributed to the beginnings of organized labor movements in Honduras and to the first major strikes in the nation's history. The first of these occurred in 1917 against the Cuyamel Fruit Company. The strike was suppressed by the Honduran military, but the following year additional labor disturbances occurred at the Standard Fruit Company's holding in La Ceiba. In 1920 a general strike hit the Caribbean coast. In response, a United States warship was dispatched to the area, and the Honduran government began arresting leaders. When Standard Fruit offered a new wage equivalent to US$1.75 per day, the strike ultimately collapsed. Labor troubles in the banana area, however, were far from ended. World War I had a generally negative impact on Honduras. In 1914 banana prices began to fall, and, in addition, the war reduced the overall amount of agricultural exports. The United States entry into the war in 1917 diverted ships to the war effort, making imported goods, such as textiles scarce. The shortages of goods in turn led to inflation, and the decline in trade reduced government revenues from tariffs. The banana companies, however, continued to prosper; Standard Fruit reported earnings of nearly US$2.5 million in 1917. Despite its problems, Honduras supported the United States war effort and declared war on Germany in 1918. Fears of disturbances increased again in 1928 as the scheduled presidential elections approached. The ruling PNH nominated General Carías while the PLH, united again following the death of Policarpo Bonilla in 1926, nominated Vicente Mejía Colindres. To the surprise of most observers, both the campaign and the election were conducted with a minimum of violence and intimidation. Mejía Colindres won a decisive victory--obtaining 62,000 votes to 47,000 for Carías. Even more surprising was Carías's public acceptance of defeat and his urging of his supporters to accept the new government. Mejía Colindres took office in 1929 with high hopes for his administration and his nation. Honduras seemed on the road to political and economic progress. Banana exports, then accounting for 80 percent of all exports, continued to expand. By 1930 Honduras had become the world's leading producer of the fruit, accounting for one-third of the world's supply of bananas. United Fruit had come increasingly to dominate the trade, and in 1929 it bought out the Cuyamel Fruit Company, one of its two principal remaining rivals. Because conflicts between these companies had frequently led to support for rival groups in Honduran politics, had produced a border controversy with Guatemala, and may have even contributed to revolutionary disturbances, this merger seemed to promise greater domestic tranquility. The prospect for tranquility was further advanced in 1931 when Ferrera was killed while leading one last unsuccessful effort to overthrow the government. Despite growing unrest and severe economic strains, the 1932 presidential elections in Honduras were relatively peaceful and fair. The peaceful transition of power was surprising because the onset of the depression had led to the overthrow of governments elsewhere throughout Latin America, in nations with much stronger democratic traditions than those of Honduras. Mejía Colindres, however, resisted pressure from his own party to manipulate the results to favor the PLH candidate, Angel Zúñiga Huete. As a result, the PNH candidate, Carías, won the election by a margin of some 20,000 votes. On November 16, 1932, Carías assumed office, beginning what was to be the longest period of continuous rule by an individual in Honduran history. Lacking, however, was any immediate indication that the Carías administration was destined to survive any longer than most of its predecessors. Shortly before Carías's inauguration, dissident liberals, despite the opposition of Mejía Colindres, had risen in revolt. Carías had taken command of the government forces, obtained arms from El Salvador, and crushed the uprising in short order. Most of Carías's first term in office was devoted to efforts to avoid financial collapse, improve the military, engage in a limited program of road building, and lay the foundations for prolonging his own hold on power. The economic situation remained extremely bad throughout the 1930s. In addition to the dramatic drop in banana exports caused by the depression, the fruit industry was further threatened by the outbreak in 1935 of epidemics of Panama disease (a debilitating fungus) and sigatoka (leaf blight) in the banana-producing areas. Within a year, most of the country's production was threatened. Large areas, including most of those around Trujillo, were abandoned, and thousands of Hondurans were thrown out of work. By 1937 a means of controlling the disease had been found, but many of the affected areas remained out of production because a significant share of the market formerly held by Honduras had shifted to other nations. Political controls were instituted slowly under Carías. The Communist Party of Honduras (Partido Comunista de Honduras--PCH) was outlawed, but the PLH continued to function, and even the leaders of a small uprising in 1935 were later offered free air transportation should they wish to return to Honduras from their exile abroad. At the end of 1935, however, stressing the need for peace and internal order, Carías began to crack down on the opposition press and political activities. Meanwhile, the PNH, at the president's direction, began a propaganda campaign stressing that only the continuance of Carías in office could give the nation continued peace and order. The constitution, however, prohibited immediate reelection of presidents. The method chosen by Carías to extend his term of office was to call a constituent assembly that would write a new constitution and select the individual to serve for the first presidential term under that document. Except for the president's desire to perpetuate himself in office, there seemed little reason to alter the nation's basic charter. Earlier constituent assemblies had written thirteen constitutions (only ten of which had entered into force), and the latest had been adopted in 1924. The handpicked Constituent Assembly of 1936 incorporated thirty of the articles of the 1924 document into the 1936 constitution. The major changes were the elimination of the prohibition on immediate reelection of a president and vice president and the extension of the presidential term from four to six years. Other changes included restoration of the death penalty, reductions in the powers of the legislature, and denial of citizenship and therefore the right to vote to women. Finally, the new constitution included an article specifying that the incumbent president and vice president would remain in office until 1943. But Carías, by then a virtual dictator, wanted even more, so in 1939 the legislature, now completely controlled by the PNH, obediently extended his term in office by another six years (to 1949). The PLH and other opponents of the government reacted to these changes by attempting to overthrow Carías. Numerous efforts were made in 1936 and 1937, but all were successful only in further weakening the PNH's opponents. By the end of the 1930s, the PNH was the only organized functioning political party in the nation. Numerous opposition leaders had been imprisoned, and some had reportedly been chained and put to work in the streets of Tegucigalpa. Others, including the leader of the PLH, Zúñiga Huete, had fled into exile. The value of these ties became somewhat questionable in 1944 when popular revolts in Guatemala and El Salvador deposed Ubico and Hernández Martínez. For a time, it seemed as if revolutionary contagion might spread to Honduras as well. A plot, involving some military officers as well as opposition civilians, had already been discovered and crushed in late 1943. In May 1944, a group of women began demonstrating outside of the Presidential Palace in Tegucigalpa, demanding the release of political prisoners. Despite strong government measures, tension continued to grow, and Carías was ultimately forced to release some prisoners. This gesture failed to satisfy the opposition, and antigovernment demonstrations continued to spread. In July several demonstrators were killed by troops in San Pedro Sula. In October a group of exiles invaded Honduras from El Salvador but were unsuccessful in their efforts to topple the government. The military remained loyal, and Carías continued in office. Anxious to curb further disorders in the region, the United States began to urge Carías to step aside and allow free elections when his current term in office expired. Carías, who by then was in his early seventies, ultimately yielded to these pressures and announced October 1948 elections, in which he would refrain from being a candidate. He continued, however, to find ways to use his power. The PNH nominated Carías's choice for president--Juan Manuel Gálvez, who had been minister of war since 1933. Exiled opposition figures were allowed to return to Honduras, and the PLH, trying to overcome years of inactivity and division, nominated Zúñiga Huete, the same individual whom Carías had defeated in 1932. The PLH rapidly became convinced that it had no chance to win and, charging the government with manipulation of the electoral process, boycotted the elections. This act gave Gálvez a virtually unopposed victory, and in January 1949, he assumed the presidency. Evaluating the Carías presidency is a difficult task. His tenure in office provided the nation with a badly needed period of relative peace and order. The country's fiscal situation improved steadily, education improved slightly, the road network expanded, and the armed forces were modernized. At the same time, nascent democratic institutions withered, opposition and labor activities were suppressed, and national interests at times were sacrificed to benefit supporters and relatives of Carías or major foreign interests. Once in office, Gálvez demonstrated more independence than had generally been anticipated. Some policies of the Carías administration, such as road building and the development of coffee exports, were continued and expanded. By 1953 nearly one-quarter of the government's budget was devoted to road construction. Gálvez also continued most of the prior administration's fiscal policies, reducing the external debt and ultimately paying off the last of the British bonds. The fruit companies continued to receive favorable treatment at the hands of the Gálvez administration; for example, United Fruit received a highly favorable twenty-five-year contract in 1949. Galvez, however, instituted some notable alterations from the preceding fifteen years. Education received increased attention and began to receive a larger share of the national budget. Congress actually passed an income tax law, although enforcement was sporadic at best. The most obvious change was in the political arena. A considerable degree of press freedom was restored, the PLH and other groups were allowed to organize, and even some labor organization was permitted. Labor also benefited from legislation during this period. Congress passed, and the president signed, legislation establishing the eight-hour workday, paid holidays for workers, limited employer responsibility for work-related injuries, and regulations for the employment of women and children. The new PLH administration undertook several major efforts to improve and modernize Honduran life. Funds were obtained from the International Monetary Fund (IMF--see Glossary) to stabilize the currency and from the World Bank (see Glossary) to begin paving a highway from the Caribbean coast to the capital. Other efforts were undertaken to expand education. The greatest attention was devoted to passing a new labor code, establishing a social security system, and beginning a program of agrarian reform. López Arellano rapidly moved to consolidate his hold on power. Growing radical influence had been one of the reasons advanced to justify the coup; once in power the government disbanded or otherwise attacked communist, pro-Castro, and other elements on the left. The Agrarian Reform Law was effectively nullified, in part by the regime's refusal to appropriate money for the National Agrarian Institute (Instituto Nacional Agrario--INA). The country's two peasant unions were harassed, although a new organization of rural workers, the National Union of Peasants (Unión Nacional de Campensinos--UNC), which had Christian Democratic ties, actually expanded in the mid- and late-1960s. López Arellano promised to call elections for yet another legislature, and early in 1964 his government was recognized by the new United States administration of President Lyndon B. Johnson. Shortly thereafter, military assistance, which had been suspended following the coup, was resumed. Close ties soon developed between the military government and the PNH. A key factor in the development of these links was PNH leader Ricardo Zúñiga Augustinius, who became secretary of state for the presidency, the key cabinet position. Numerous other party members served in the government, giving it a civil-military character but widening the gap between the administration and the PLH. Also linked to the government was a secret organization used to attack the left and intimidate political opponents. Known as the Mancha Brava (Tough Spot), it reputedly drew much of its membership from the ranks of public employees. To give a semblance of legality to his government, López Arellano promulgated a new constitution with a unicameral Congress. He then called elections for this new Congress. A general amnesty for political figure was decreed in November, exiles were allowed to return, and the PLH resumed political activity. The PNH had pledged throughout the campaign that if it gained control of the Congress, its members would select López Arellano as president. The vote was held on February 16, 1965; the PNH won 35 seats, the PLH 29. The PLH charged the government with fraudulently manipulating the results, and some party leaders urged their supporters to boycott meetings of the assembly. The PLH was unable to agree on this tactic, and enough PLH members took their seats when the Congress convened on March 15 to provide the necessary quorum. The PNH delegates kept their promise and elected López Arellano as president for a new six-year term, from 1965 to 1971. For a time, López Arellano had success in foreign affairs. One of his government's first acts had been to join with Guatemala and Nicaragua in establishing the Central American Defense Council (Consejo de Defensa Centroamericana--Condeca), which was a military pact among these Central American states and the United States for coordination of counterinsurgency activities. El Salvador joined shortly thereafter, and in 1965 Condeca held its first joint military exercise on the Caribbean coast of Honduras. That same year, Honduras contributed a small contingent of troops to the Organization of American States (OAS) forces monitoring the election in the Dominican Republic. As the 1960s progressed, Honduras's relations with Nicaragua and with the United States improved, but increasing problems developed between Honduras and El Salvador. In May and June 1967, a series of incidents along the border aggravated tensions considerably. One incident involved the capture of two Salvadoran officers and thirty-nine enlisted men whose truck convoy had penetrated several kilometers into Honduras. The Salvadoran troops were finally returned over a year later, but the tensions continued to mount. By 1968 the López Arellano regime seemed to be in serious trouble. The economic situation was producing growing labor conflicts, political unrest, and even criticism from conservative groups such as Fenagh. Municipal elections were held in March 1968 to the accompaniment of violence and charges of open fraud, producing PNH victories but also fueling public discontent and raising the concern of the United States Embassy. Efforts at opening up a dialogue were made in mid-1968 but had little success. Later in the year a general strike was kept brief by government action that helped break the strike and exiled the leader of the major Caribbean coast labor federation. Unrest continued, however; in the spring of 1969 new strikes broke out among teachers and other groups. As the political situation deteriorated, the Honduran government and some private groups came increasingly to place blame for the nation's economic problems on the approximately 300,000 undocumented Salvadoran immigrants in Honduras. Fenagh began to associate Salvadoran immigrants with illegal land invasions, and in January 1969, the Honduran government refused to renew the 1967 Bilateral Treaty on Immigration with El Salvador that had been designed to regulate the flow of individuals across their common border. In April INA announced that it would begin to expel from their lands those who had acquired property under agrarian reform without fulfilling the legal requirement that they be Honduran by birth. Attacks were also launched in the media on the impact of Salvadoran immigrant labor on unemployment and wages on the Caribbean coast. By late May, Salvadorans began to stream out of Honduras back to an overpopulated El Salvador. Tensions continued to mount during June 1969. The soccer teams of the two nations were engaged that month in a three-game elimination match as a preliminary to the World Cup. Disturbances broke out during the first game in Tegucigalpa, but the situation got considerably worse during the second match in San Salvador. Honduran fans were roughed up, the Honduran flag and national anthem were insulted, and the emotions of both nations became considerably agitated. Actions against Salvadoran residents in Honduras, including several vice consuls, became increasingly violent. An unknown number of Salvadorans were killed or brutalized, and tens of thousands began fleeing the country. The press of both nations contributed to a growing climate of near- hysteria, and on June 27, 1969, Honduras broke diplomatic relations with El Salvador. Early on the morning of July 14, 1969, concerted military action began in what came to be known as the Soccer War. The Salvadoran air force attacked targets inside Honduras and the Salvadoran army launched major offensives along the main road connecting the two nations and against the Honduran islands in the Golfo de Fonseca. At first, the Salvadorans made fairly rapid progress. By the evening of July 15, the Salvadoran army, which was considerably larger and better equipped than its Honduran opponent, pushed the Honduran army back over eight kilometers and captured the departmental capital of Nueva Ocotepeque. Thereafter, the attack bogged down, and the Salvadorans began to experience fuel and ammunition shortages. A major reason for the fuel shortage was the action of the Honduran air force, which--in addition to largely destroying the smaller Salvadoran air force--had severely damaged El Salvador's oil storage facilities. The day after the fighting had begun, the OAS met in an urgent session and called for an immediate cease-fire and a withdrawal of El Salvador's forces from Honduras. El Salvador resisted the pressures from the OAS for several days, demanding that Honduras first agree to pay reparations for the attacks on Salvadoran citizens and guarantee the safety of those Salvadorans remaining in Honduras. A cease-fire was arranged on the night of July 18; it took full effect only on July 20. El Salvador continued until July 29 to resist pressures to withdraw its troops. Then a combination of pressures led El Salvador to agree to a withdrawal in the first days of August. Those persuasive pressures included the possibility of OAS economic sanctions against El Salvador and the dispatch of OAS observers to Honduras to oversee the security of Salvadorans remaining in that country. The actual war had lasted just over four days, but it would take more than a decade to arrive at a final peace settlement. The war produced only losses for both sides. Between 60,000 and 130,000 Salvadorans had been forcibly expelled or had fled from Honduras, producing serious economic disruption in some areas. Trade between the two nations had been totally disrupted and the border closed, damaging the economies of both nations and threatening the future of the Central American Common Market (CACM). Up to 2,000 people, the majority Honduran civilians, had been killed, and thousands of other Hondurans in the border area had been made homeless. Airline service between the two nations was also disrupted for over a decade. After the war, public support for the military plummeted. Although the air force had performed well, the army had not. Criticism of the army was not limited to the public; junior officers were often vocal in their criticism of superiors, and a rift developed between junior and senior officers. The war, however, led to a new sense of Honduran nationalism and national pride. Tens of thousands of Honduran workers and peasants had gone to the government to beg for arms to defend their nation. Local defense committees had sprung up, with thousands of ordinary citizens, often armed only with machetes, taking over local security duties. This response to the fighting made a strong impression on a sector of the officer corps and contributed to an increased concern over national development and social welfare among the armed forces. The internal political struggle had been briefly suspended during the conflict with El Salvador, but by the start of 1970 it was again in full swing. The government was under pressure to initiate administrative and electoral reforms, allow open elections in 1971, reorganize the military, and adopt new economic programs, including a revision of Honduran relations with the CACM. Labor, peasant, and business organizations were meeting together in what were known as the fuerzas vivas (living forces). Their representatives met with López Arellano and proposed a Plan of National Unity, calling for free elections, a coalition cabinet, and a division of government posts and congressional seats. These proposals failed to elicit immediate response, but discussions continued. Meanwhile, a general political amnesty was decreed, the creation of the Honduran Christian Democratic Party (Partido Demócrata Cristiano de Honduras--PDCH) was announced, and a decree was issued calling for presidential and congressional elections on March 28, 1971. After considerable discussion and debate, the PHL and PNH parties responded to pressures from labor, business, and the military. On January 7, 1971, they signed a political pact agreeing to establish a national-unity government after the March elections. The purposes of the pact were twofold. The first was to present a single slate of congressional candidates that would divide the Congress equally between the PLH and PNH (each party would run its own candidate for the presidency, however.) The second goal was to promote the Minimum Government Plan (Plan Mínimo de Gobierno), which included achieving agrarian reform, increasing technical education, passing a civil service law, attempting to resolve the conflict with El Salvador, restructuring the CACM, and reforming government administration. A later agreement between the parties-- the "little pact" ("pactito")--agreed to a division of government posts, including those in the Supreme Court of Justice. The 1971 elections were relatively free and honest. Both parties offered presidential candidates who were compromise choices of the major party factions. The PLH ran Jorge Bueso Arias, and the PNH nominated Ramón Ernesto Cruz. Most observers anticipated a PLH victory, but the PNH ran a more aggressive campaign, making use of the mass media and of modern campaign techniques for the first time in Honduran history. On election day, Cruz scored an impressive victory, gaining 299,807 votes to 269,989 for Bueso Arias. However, a disturbing note for the PNH was that popular participation in the election had declined significantly from 1965. Only slightly over two-thirds of those registered to vote had done so, although the constitution made voting obligatory. At first, Cruz appeared to be living up to the terms of the agreements between the parties. He appointed five PLH members, five PNH members, and one military officer to his cabinet. López Arellano remained as chief of the armed forces. As time passed, however, the split between PLH and PNH widened steadily. In order to deal with the budget crisis, Cruz pushed through a reluctant Congress a bill that cut tax benefits and import exemptions. This bill produced opposition from both business and labor sectors. In the area of agrarian reform, the president soon removed INA's dynamic director, Roberto Sandoval, and replaced him with a PNH member, Horacio Moya Posas, who slowed the pace of reform. The PLH protested this action and also argued that the appointment of PNH supporters to the Supreme Court of Justice violated the agreement. Finally, in March 1972, the president dismissed two of the PLH cabinet members. By mid-1972, the government had lost most of its non-PNH support. During the autumn of 1972, with the support of the military, the two parties attempted to revise the arrangements between the parties and the major labor and business groups. These efforts were not unsuccessful, and opposition to what was increasingly perceived as an ineffectual and divisive administration spread steadily. The virtual halting of agrarian reform and the killing of several peasants by the military in the department of Olancho had angered peasant groups. Labor and business were alienated by the ineffective efforts to deal with the problems of the economy. The PLH felt that its position within the government was steadily eroding and that its agreement with the PNH was regularly violated. In December peasant and labor organizations announced a hunger march by 20,000 individuals to Tegucigalpa to protest the government's agrarian policies. Supported by a prior agreement with the labor movement, the military on December 4, 1972, overthrew Cruz in a bloodless coup and once again installed López Arellano as the president. Problems for the López Arellano regime began to increase in 1974. The economy was still growing at a slow pace, partly because of the immense damage caused to the Caribbean coast by Hurricane Fifi in September 1974. The storm was the most devastating natural disaster in recent Honduran history, claiming 10,000 or more lives and destroying a vast number of banana plants. The disaster also increased calls for agrarian reform. The government's greatest problem, however, centered on another aspect of the banana industry. Honduras had joined other bananaexporting nations in a joint agreement to levy an export tax on that fruit. The Honduran tax had taken effect in April 1974 but was suddenly canceled four months later. Shortly thereafter, reports began to circulate that the United Fruit Company had paid more than US$1 million to Honduran officials to secure the repeal of the tax. Prominently implicated in these accusations were López Arellano and his minister of economy and commerce. 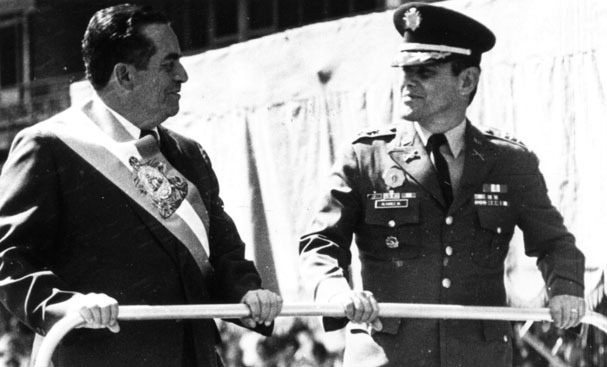 Reacting to these charges on March 31, 1975, the military relieved López Arellano of his position as chief of the armed forces, replacing him with Colonel Juan Alberto Melgar Castro. Just over three weeks later, they completed the process by removing López Arellano from the presidency and replacing him with Melgar Castro. These decisions had been made by the increasingly powerful Supreme Council of the Armed Forces (Consejo Superior de las Fuerzas Armadas--Consuffaa), a group of approximately twenty to twenty-five key colonels of the armed forces who provided the institution with a form of collective leadership. In July 1976 the border with El Salvador was still disputed. In July a minor upsurge of conflict there brought prompt OAS intervention, which helped to keep the conflict from escalating. In October both nations agreed to submit their dispute to arbitration. This development raised hopes for a rapid peace settlement. Progress, however, proved slow; and tensions were raised again, briefly, in 1978, when the Honduran government abruptly canceled all permits for travel to El Salvador. The rise of guerrilla conflict in El Salvador, plus strong pressures from other nations, made a settlement increasingly urgent in subsequent months. In October 1980, with Peruvian mediation, the bilateral General Peace Treaty was finally signed in Lima, Peru. Trade and travel were soon resumed, but numerous problems, including final adjudication of some small parcels of territory along the frontier, remained for later consideration . Relations with Nicaragua had also become more difficult, especially after civil conflict had increased in that nation in the late 1970s. In March 1978, Honduran soldiers captured Germán Pomares, a leader of the Sandinista National Liberation Front (Frente Sandinista de Liberación Nacional--FSLN), the guerrilla force fighting against the regime of Anastasio Somoza Debayle in Nicaragua. Pomares was held until the end of June, but Nicaraguan requests for extradition were denied, and he was ultimately flown to Panama. As fighting in Nicaragua escalated in 1978 and early 1979, Honduras found itself in a difficult position. Honduras did not want to support the unpopular Somoza regime but feared the Marxist leanings of the FSLN. In addition, beginning in September 1978, Honduras had become burdened with an ever-growing number of refugees from Nicaragua. Melgar Castro's hold on power began to dissolve in 1978. Charges of government corruption and of military links with narcotics traffic had become increasingly widespread, leading to accusations that the government had failed to adequately defend the country. Melgar's hold on power had weakened because he lacked support among large landowners. In addition, the Melgar government had seemed to be making little progress toward promised elections, leading to suspicions that it hoped to prolong its time in office. Right-wing political forces criticized the Melgar administration's handling of the Ferrari Case, which involved drug trafficking and murder of civilians and in which members of the military had been implicated. Unions and student organizations correctly interpreted the rightwing 's criticism as a prelude to a coup. When demonstrators took to the streets to support Melgar, right-wing elements within the military charged Melgar had lost control of public order and ousted him. On August 7, 1978, Melgar Castro and his cabinet were replaced by a three-member junta. Led by General Policarpo Paz García, chief of the armed forces, and including the air force commander and the chief of military security, the junta had close ties to the large landowners and moved to protect the military men involved in the Ferrari Case. From its inception, the government of Paz García had promised to return Honduras to civilian rule. In April 1980, the Honduran citizenry was summoned to the polls to choose delegates for a new Congress. The Congress would select an interim government and would establish procedures for presidential and congressional elections in 1981. Early indications for the 1980 elections pointed toward a victory for the PNH, headed by Ricardo Zúñiga. The PNH appeared more unified and organized than the rival PLH, and most people assumed that the PNH would be favored by the ruling military. The PLH suffered from internal divisions and a lack of leadership. Former president Villeda Morales had died in 1971, and the party's leader after his death, Modesto Rodas Alvarado, had died in 1979. A split had developed between the more conservative followers of Rodas and the party's left wing, which had formed the Popular Liberal Alliance (Alianza Liberal del Pueblo--Alipo). In addition, a third party, the Innovation and Unity Party (Partido de Inovación y Unidad--Pinu) had been registered and was expected to draw support away from the PLH. The PNH had succeeded in blocking the inscription of the PDCH, leading the PDCH adherents to join with groups further to the left in denouncing the elections as a farce and a fraud and urging popular abstention. The April 1980 election produced a record registration and voter turnout. More than 1.2 million Hondurans registered, and over 1 million voted--over 81 percent of those eligible. The high number of voters evidently favored the PLH, which won 49.4 percent of the votes cast. Under a complex apportionment system, the PLH won thirty-five seats in the Congress; the PNH, thirty-three; and Pinu, three. This result produced considerable debate over the composition of the next government. There was general agreement on naming Paz García as interim president, and the disputes centered on the composition of the cabinet. Ultimately, a PLH leader, Roberto Suazo Córdova, was made president of the Congress, while the PLH also gained five of the seats on the new Supreme Court of Justice. The cabinet was divided among all three parties and the military; the armed forces received the Ministry of National Defense and Public Security, as well as the Ministry of Foreign Affairs, and the PNH acquired key economic positions. The Congress took more than a year to draft a new constitution and an electoral law for the 1981 presidential and congressional elections. The work went slowly, and the elections originally scheduled for August 1981 had to be postponed until November. In the interim, the National Elections Tribunal (Tribunal Nacional de Elecciones--TNE) unanimously granted the PDCH the legal status needed for a place on the 1981 ballot. Despite the presence of candidates for the Pinu and the PDCH on the November 1981 ballot, it was clear that the election would be essentially a two-party affair between the PLH and PNH. On November 29, 1981, a total of 1,214,735 Hondurans, 80.7 percent of those registered, voted, giving the PLH a sweeping victory. Suazo Córdova won 636,392 votes (52.4 percent), the PNH 491,089 votes, and 48,582 votes were divided between the Pinu and the PDCH. The PLH also took control of Congress, winning forty-four seats; the PNH, thirtyfour ; the Pinu, three; and the PDCH, one. The PLH also won 61 percent of the municipal councils. Suazo Córdova was inaugurated as president of Honduras in January 1982, ending nearly a decade of military presidents. President Suazo Córdova (See photo with General Martinez) assumed office at a time of extreme political ferment in Central America. The United States government was seeking to halt or roll back the advances of what it considered to be pro-Soviet forces on the isthmus. The leftist insurgency launched by the Farabundo Martí National Liberation Front (Frente Farabundo Martí de Liberación Nacional--FMLN) in El Salvador had been underway for some two years, and the outcome of the struggle in that country was in doubt. In Nicaragua, the FSLN--with close ties to Cuba, the Soviet Union, and other communist states--ruled repressively and continued a military buildup unprecedented for the region. Honduras--a country poor in resources, lacking in democratic traditions, and strategically located between these two revolutionary governments--almost inexorably drew the attention and involvement of Washington. Suazo Córdova, a country doctor from La Paz, was a veteran of Honduran political infighting, but he lacked the kind of experience that might have prepared him for the internationalist role he would play as president of the republic. His initial approach to the question of Honduras's role in the growing regional crisis appeared to stress coexistence rather than confrontation. This approach reflected Honduras's historical passivity in regional and international affairs and took into account the regional balance of power, which did not favor Honduras. As a result, Suazo Córdova's inaugural speech stressed the issues of self-determination and the administration's desire to remain neutral in the face of regional upheaval. In keeping with this conciliatory approach, on March 23, 1982, Minister of Foreign Affairs Edgardo Paz Barnica proposed a peace plan to the permanent council of the OAS. The plan was based on the following six points: general disarmament in Central America, the reduction of foreign military and other advisers (then a real point of contention with the Nicaraguan government), international supervision of any final agreement, an end to regional arms traffic, respect for delineated and demarcated borders, and the establishment of a permanent multilateral dialogue. The proposal met with little support from other Central American states, particularly Nicaragua. Gradually, the Suazo Córdova administration began to perceive the FSLN (commonly referred to as Sandinista) administration as obstructionist in regional and international forums, as well as a subversive force that intended to undermine political stability in Honduras through intimidation, propaganda, and direct aid to incipient insurgent groups. The emergence of a consensus on this point within both the Honduran administration and armed forces coincided with a significant expansion of the United States role in Honduras, both as policy adviser and as purveyor of military and economic aid. Brigadier General Gustavo Álvarez Martínez, who assumed the position of commander of the armed forces in January 1982 emerged as a hardliner against the Sandinistas. Álvarez publicly declared Honduras "in a war to the death" with Nicaragua; he believed such a war should be conducted under the auspices of a triple alliance among Guatemala, El Salvador, and Honduras. Some observers also believed that Álvarez had another aspect to his anticommunist strategy, namely covert domestic surveillance and extralegal executions. Álvarez's training in Argentina, where such "dirty war" tactics were common in the 1970s, lent some credence to the charges of increased disappearances and other less extreme forms of harassment against the Honduran left. Álvarez's main rival for the post of armed forces commander, Colonel Leónidas Torres Arias, the former head of military intelligence, had assumed an attaché post in Buenos Aires, Argentina, after losing the struggle for command. From Argentina, Torres proceeded to castigate Álvarez in the media, charging that the general operated a personal death squad. The Honduran Committee for the Defense of Human Rights appeared to confirm Torres's charges to some degree by reporting an increase in the number of political disappearances nationwide. According to foreign observers, the total numbers in no way rivaled those registered in El Salvador or Guatemala; the increase, however, was statistically significant for previously tranquil Honduras. Álvarez's strong-arm tactics drew criticism from some observers, particularly the foreign press and international human rights groups. At the same time, however, leftist subversive activity did expand in the early 1980s. Much of this increase was attributed directly or indirectly to Sandinista support for like-minded Honduran groups such as the PCH, the Lorenzo Zelaya Popular Revolutionary Forces (Fuerzas Populares Revolucionarias-Lorenzo Zelaya--FPR-LZ), and the Honduran Revolutionary Party of Central American Workers (Partido Revolucionario de los Trabajadores Centroamericanos de Honduras--PRTC-H). Beginning with minor bombings, these groups eventually progressed to kidnappings and hijackings. The most ambitious effort was that launched by a platoon-sized unit of Nicaraguan-trained PRTC-H members who crossed the border from Nicaragua into Olancho department in September 1983. A rapid response by Honduran troops isolated the PRTC-H column; twenty- three of the guerrillas surrendered, and another twenty-six died in the mountains, many of starvation and exposure. A similar incursion in 1984 also failed to strike a revolutionary spark among the conservative Honduran peasantry. The perception of a genuine leftist revolutionary threat to Honduran stability enhanced Brigadier General Álvarez's power and heightened his profile both in Honduras and the United States. The resultant appearance of an imbalance of power between the military and the nascent civilian government called into question the viability of Honduras's democratic transition. Some observers saw in Álvarez a continuation in the long series of military caudillos who had ruled the nation since independence. A coup and reimposition of direct military rule appeared a virtual certainty to those who doubted Honduras's affinity for any form of democratic government. Others, however, pictured Álvarez more in the mold of Argentina's Juan Perón--a military-based caudillo who successfully made the transition to populist civilian politics. Like most officers, Álvarez had ties to the PNH. Álvarez served as president of the Association for the Progress of Honduras (Asociación para el Progreso de Honduras--Aproh), a group made up mainly of conservative businesspeople and PNH leaders. The initial goals of Aproh were to attract foreign investment and to block the growth of "popular organizations" (labor unions, campesino groups, and other activist groups) such as those that supported the FMLN in El Salvador. Aproh's acceptance of funding from the South Korea-based Unification Church proved controversial and generated negative publicity for both the organization and for Álvarez. The general's purportedly popular following, moreover, was suspect. He seemed much more comfortable and adept at high-level political maneuvering than at grassroots organization. Eventually, even his support within the armed forces proved to be inadequate to sustain his ambitions. Although Álvarez had appeared ascendant by 1982, some observers described the political situation in Honduras as a triumvirate: Brigadier General Álvarez formulating national security policy and refraining from a direct military takeover of the government; President Suazo supporting Álvarez's policies in return for military tolerance of his rule and military support for his domestic policies; and the United States government providing the economic and military aid that helped sustain the arrangement. Some disputed the claim that Suazo was subservient to the military by pointing out the fact that the president refused to increase the budget of the armed forces. That budget, however, failed to take foreign military aid into account. The increase in United States military aid from US$3.3 million in fiscal year (FY--see Glossary) 1980 to US$31.3 million in FY 1982, therefore, represented a substantial expansion in the military's role in government. Álvarez strongly supported United States policy in Central America. He reportedly assisted in the initial formation of the Nicaraguan Resistance (more commonly known as the Contras, short for contrarevolucionarios--counterrevolutionaries in Spanish), arranged large-scale joint exercises with United States forces, and agreed to allow the training of Salvadoran troops by United States special forces at a facility near Puerto Castilla known as the Regional Center for Military Training (Centro Regional de Entrenamiento Militar--CREM). The latter action eventually contributed greatly to Álvarez's ouster in early 1984. The other major factor in the Álvarez ouster was the general's attempt to streamline the command structure of the armed forces. Traditionally, a collegial board made up of field-grade officers consulted with the commander in the formulation of policy for the Honduran armed forces. Álvarez proposed to eliminate this organization, the Supreme Council of the Armed Forces (Consejo Superior de las Fuerzas Armadas--Consuffaa), and to replace it with a board of eight senior officers. The reorganization would have concentrated and enhanced Álvarez's power over the military by allowing him to name his most trusted commanders to a leadership board that would rubber-stamp his policy proposals. At the same time, the reorganization had promised to make the armed forces function more efficiently, an important consideration if hostilities broke out between Honduras and Nicaragua. Alvarez's view on involvement in Nicaragua led directly to the 1984 rebellion by his officers. Most observers had expected Honduras to serve as one staging area for a United States military intervention in Nicaragua if such an operation took place. The flawed but successful Operation Urgent Fury on the Caribbean island of Grenada in November 1983 had seemed to increase the likelihood of military action against the Sandinista regime in Nicaragua. Although Álvarez supported a military solution to the "Nicaraguan problem," a significant faction of the Honduran officer corps held divergent convictions. These more nationalistic, more isolationist officers saw Álvarez as subservient to the United States, giving up more in terms of sovereignty than he received in aid. These officers also resented Álvarez's posturing in the media and his apparent aspirations to national leadership. On a more mundane level, certain officers also feared that Álvarez would force them out after he had solidified his power base within the officer corps. The prospect of early, involuntary retirement, with its attendant loss of licit and illicit income, prompted a clique of senior officers to move against Álvarez on March 31, 1984, seizing him and dispatching him on a flight to Miami. The ouster of Álvarez produced a number of repercussions both in Honduran domestic politics and in Honduran-United States relations. The armed forces, which had appeared to be moving in a more activist and outward-looking direction under Álvarez, assumed a more isolationist stance toward regional relations and United States policy initiatives. Air Force Brigadier General Walter López Reyes, the new commander in chief, demanded further increases in military aid in return for Honduran cooperation in regional affairs. After some equivocation, López closed the CREM. He also scaled back Honduran-United States military exercises. On May 21, 1985, President Suazo Córdova and United States President Ronald W. Reagan signed a joint communiqué that amended a 1982 annex to the 1954 Military Assistance Agreement between the two countries. Although the new accord allowed the United States to expand and improve its temporary facilities at Palmerola Air Base near Comayagua, it generally limited Honduran cooperation in comparison to the terms of the 1982 annex. By 1984 the armed forces under López began to exert pressure on the United States-backed Contra forces, the bulk of which operated from bases in the southern departments of El Paraíso and Olancho. Honduran foreign minister Edgardo Paz Barnica reflected the new attitude toward the Contras in January 1985, when he announced that the government planned to expel them from Honduras. Although that statement reflected bravado and frustration more than reality, the Honduran military took more active steps to pressure both the Contras and, indirectly, the United States government. In February 1985, the armed forces ordered the Contras to close a hospital that they had set up outside of Tegucigalpa. The Hondurans also ordered the Contras to shut down an office that had been used to receive official visitors, mainly from the United States. Around the same time, Honduran troops turned back two United States Department of State employees from a planned visit to a Contra training camp; the troops told the Americans that they lacked a newly required permit to enter the area. President Suazo Córdova had foreshadowed the Honduran ambivalence toward the Contras in a July 1983 letter to President Reagan, in which Suazo Córdova stated that "our people are beginning to ask with greater vigor if it is convenient to our own interests to be so intimately linked to the interests of the United States if we receive so little in exchange." Although 1983 and 1985 public opinion polls had shown that a majority of Hondurans supported United States policy in Central America, there was still a growing uneasiness over the country's role as reluctant host to Nicaraguan rebel forces. At the height of the conflict with the Sandinista Popular Army (Ejercito Popular Sandinista--EPS), in the mid 1980s the Contra forces reportedly totaled between 12,000 and 17,000, depending on the source of the estimate. This force level rivaled that of the entire Honduran armed forces. This fact and the continued close ties between Honduras and the United States made it doubtful that the armed forces would expel the Nicaraguan rebels from Honduran territory by force. However, the prospect of an EPS victory over the Contras, which most observers considered inevitable, raised the disturbing prospect of a foreign armed force trapped on Honduran soil. Most Hondurans believed that, under such circumstances, the Nicaraguans would fail to assimilate well into the Honduran population and would resort to banditry in order to survive. Honduran politicians reflected little faith in the willingness of the United States to assist them should events take such a negative turn. Most believed that, following a Contra defeat, Washington would cut its losses and withdraw all support from the group. Continued and sharply increased United States military aid to Honduras was the counterbalance to the prospect of United States withdrawal from the Nicaraguan conflict. For the years 1975-80, the total aid to Honduras had been US$16.3 million. From 1981-85, the total reached US$169 million. Meanwhile, the percentage of the military budget coming directly or indirectly from the United States increased from 7 percent in 1980 to 76 percent in 1985. As the Nicaraguan conflict spread, Hondurans were left to ponder the merits of the deal the armed forces had brokered. On March 22, 1986, approximately 1,500 EPS ground troops crossed the Honduran border and engaged Contra forces near the hamlet of Las Vegas. The EPS withdrew into northern Nicaragua without making contact with Honduran forces. Honduran officials acknowledged the incursion publicly, but only after United States spokespersons had trumpeted the incident as proof of the Sandinistas' aggressive intentions toward their northern neighbor. Shortly thereafter, the United States Congress approved US$100 million in military aid to the Contra forces. Other EPS incursions into Honduran territory followed, notably in December 1986 and June 1987. How much human suffering passed in the frontier region without public notice by any government remained unknown. As in decades past, the spillover of the Nicaraguan conflict into more peaceful Honduras demonstrated the interrelatedness of events in all of the states of Central America. The forced departure of Brigadier General Álvarez on March 31, 1984, and his succession by a group of officers who demonstrated less interest in political affairs than he had markedly changed the political situation prevailing in the country. President Suazo Córdova, previously restrained by his trepidations concerning lvarez, began to show signs of becoming a caudillo. Although the constitution forbade his reelection, Suazo Córdova conspired to nominate for the 1985 presidential elections Oscar Mejía Arellano, a fellow Rodista (the PLH faction founded by Modesto Rodas Alvarado). Every politician in Honduras recognized the octogenarian Mejía for what he was, namely someone who would perpetuate Suazo's control of the Presidential Palace. Nevertheless, Suazo Córdova went about promoting Mejía's candidacy with every power at his disposal. The potential key to a Mejía victory lay in the makeup of the Supreme Court of Justice, which could (under terms of the 1981 constitution) decide an election in which each candidate failed to receive a clear majority. As 1985 began, the Supreme Court contained a firm majority of Suazo Córdova supporters. The leadership of the Congress, both PLH and PNH, recognized the self-serving scenario that Suazo Córdova had set up. Moreover, they realized that the constitution granted power to the legislature to remove Supreme Court justices for cause. The Congress proceeded to do just that when fifty-three of its eighty-two deputies voted on March 29, 1985, to replace five of nine justices because of their alleged corruption. Five new justices quickly took the oath of office. During the debate over the justices's corruption, Suazo Córdova had fulminated both publicly and privately, threatening to declare a state of emergency and close the Congress if the five lost their seats on the court. Although he stopped short of fulfilling that threat, troops did surround the Congress building temporarily after the deputies announced their action. Furthermore, military police took into custody Ramón Valladares Soto, the new president of the Supreme Court. Arrests of the four new other justices followed. A lower court judge charged the five with treason. On April 1, the judge filed treason charges against fifty-three legislative deputies who had voted to replace the five justices. The proceedings against the fifty-three, if pursued to its culmination, threatened to result in the revocation of legislators' legal immunity from prosecution. The Congress rapidly reacted to Suazo's counterattack. On April 3, 1985, the assembly passed by a forty-nine to twenty-nine vote a motion censuring the president for his actions. In another action more calculated to curb the president's power, the legislature passed a bill establishing guidelines for primary elections within political parties. Had such guidelines been in place previously, the entire governmental crisis might have been avoided. Not surprisingly, Suazo Córdova vetoed the bill almost two weeks later, the day after the Rodista faction had endorsed his choice, Mejía, as the official presidential candidate of the PLH. The resolution of the crisis demonstrated how little Honduras had progressed from the days when the military had guided events either directly or indirectly. During the early April days of the dispute between Suazo Córdova and the Congress, Brigadier General López had publicly declared himself and the armed forces neutral. As events began to degenerate, however, the officer corps moved to reconcile the antagonists. At first, the military sought to resolve the dispute through informal contacts. When that failed, the armed forces convened direct negotiations between presidential and legislative representatives, with military arbiters. By April 21, the talks produced an agreement. The leaders of Congress rescinded their dismissal of the five justices and dropped their demand for primary elections. Supreme Court President Valladares received his freedom. In a complicated arrangement, it was agreed that candidates of all political factions could run for president. The winner of the election would be the faction that received the most votes within the party (PLH, PNH, or other) that received the most total votes. The arrangement conveniently ignored the provision of the constitution stating that the president must be the candidate who receives a simple majority of the popular vote. Publicly, all parties expressed approval of the outcome. Although threatened union strike action had influenced the negotiations, the strongest factor in their outcome had been pressure from the armed forces leadership. The unorthodox nature of the agreed-upon electoral procedures delayed adoption of new regulations until late in November. By that time, four PLH candidates, three PNH candidates, and several other minor party candidates had filed. The campaign appeared to pit two PLH candidates--Mejía and San Pedro Sula engineer José Azcona Hoyo--against the PNH's Rafael Leonardo Callejas Romero in a contest that saw the two PLH candidates criticize each other as much as, or more than, they did their opposition outside of their own party. The final vote count, announced on December 23, produced the result that the makeshift electoral regulations had made all but inevitable--a president who garnered less than a majority of the total popular vote. The declared winner, Azcona, boasted less than 30 percent of the vote, as opposed to Callejas's 44 percent. But because the combined total of PLH candidates equaled 54 percent, Azcona claimed the presidential sash. Callejas lodged a protest, but it was short-lived and probably represented less than a sincere effort to challenge the agreement brokered by the military. Azcona faced multiple national and regional problems as his inauguration took place on January 27, 1986. The new president's inaugural address noted the country's many social problems, but promised "no magic formulas" to solve them. He also noted the growing national debt and promised to adhere to foreign policies guided by the principle of nonintervention. Azcona's prospects for a successful presidency appeared dim, partly because his party's bloc in the Congress was still splintered, unlike the more united PNH deputies on the other side of the aisle. Beyond such parochial concerns, the crisis in Central America still raged on, presenting a daunting prospect for any Honduran leader. Although the crisis in Central America derived primarily from domestic pressures, the region's growing instability during the 1980s had drawn the attention and intervention of numerous foreign actors, chief among them the United States, the Soviet Union, and concerned nations of Latin America. The Contadora negotiating process (named for the Panamanian island where it was initiated in January 1983) sought to hammer out a solution among the five Central American nations through the mediation of the governments of Mexico, Venezuela, Colombia, and Panama. The negotiations proved arduous and protracted. By mid-1985, the talks had bogged down. The Nicaraguan delegates rejected discussion of democratization and internal reconciliation as an unwarranted intervention in their country's internal affairs. Honduras, El Salvador, Guatemala, and Costa Rica maintained that these provisions were necessary to ensure a lasting settlement. Another major point of contention was the cessation of aid to insurgent groups, particularly United States aid to the Contras. Although the United States government was not a party to the Contadora negotiations, it was understood that the United States would sign a separate protocol agreeing to the terms of a final treaty in such areas as aid to insurgents, military aid and assistance to Central American governments, and joint military exercises in the region. The Nicaraguans demanded that any Contadora treaty call for an immediate end to Contra aid, whereas all the other Central American states and the mediating countries, with the exception of Mexico, downplayed the importance of such a provision. In addition, the Nicaraguan government raised objections to specific cuts in its military force levels, citing the imperatives of the counterinsurgency campaign and defense against a potential United States invasion. In an effort to break this impasse, the governments of Argentina, Brazil, Peru, and Uruguay announced in July 1985 that they would join the Contadora process as a "support group" in an effort to resolve the remaining points of contention and achieve a comprehensive agreement. Despite the combined efforts of the original "core four" nations and the "support group," the Contadora process unofficially came to a halt during June 1986 when the Central American countries still failed to resolve their differences sufficiently to permit the signing of a final treaty draft. The United States Congress's approval of military aid to the Contras during the same month hampered the process, according to representatives of most of the mediating countries. Although the mediators vowed to continue their diplomatic efforts and did convene negotiating sessions subsequent to the unsuccessful June 6 meeting in Panama City, the Contadora process was clearly moribund. After the Contadora process stalled, the regional consensus of opinion seemed to be that a streamlined, strictly Central American peace initiative stood a better chance of success than one that included countries outside the region. During the course of the Contadora negotiations, the Honduran government had sought to achieve an agreement that would settle the Nicaraguan conflict in such a way as to assure eventual reassimilation of the Contras into Nicaraguan society. At the same time, the Honduran military had sought to maintain its expanded relationship with the United States. Paradoxically, the Honduran government found itself espousing positions similar to those supported by its traditional adversary, El Salvador. As a new democracy, Honduras also enjoyed support from the government of Costa Rica, a more established democracy. The government of Guatemalan president Marco Vinicio Cerezo Arévalo established a more independent position, but still supported the concept of a diplomatic solution to Central America's troubles. Talks continued among the Central American presidents as they sought to resolve the insurgencies in El Salvador and Nicaragua. A series of summit meetings took place during 1989. The presidents agreed to a draft plan on February 14, 1989. The plan called for the demobilization and repatriation of Contra forces within ninety days, in return for elections. Nicaraguan president Daniel José Ortega Saavedra agreed to hold a February 1990 balloting. A foreign ministers' meeting also produced agreement on foreign (but non-United States) observers to supervise the demobilization. The Central American leaders crafted the agreement largely without advice or guidance from the United States. Although the United States remained Honduras's leading supporter and ally, the United States administration gradually lost influence over events in Central America as the Esquipulas process played out. Having apparently neglected its relationship with President Azcona, the administration of George H.W. Bush (1989-93) turned to a more established connection, that between the United States government and the Honduran armed forces. Although Brigadier General López had been purged and exiled in February 1986, the armed forces maintained a pro-United States stance. After discussions with Bush administration envoys, the Honduran officer corps agreed that nonmilitary aid to the Contras should continue despite the February agreement. President Azcona, reportedly persuaded by the military, announced that humanitarian aid to the Contras would reduce the security threat to Honduras and would not violate the terms of the February 1989 agreement. The ninety-day timetable established by the February 1989 agreement proved unworkable. In order to avoid losing momentum, the five presidents reconvened in Tela, Honduras, beginning on August 5, 1989. Once again, the presidents negotiated without input from the United States government. They produced a new schedule for Contra demobilization, with a deadline of December 5, 1989. The OAS agreed to supervise the process. Although the Bush administration expressed disapproval of the new agreement, the White House and United States Congress agreed that the Contras' aid would be cut off if the Nicaraguan rebels failed to disband; the United States Congress approved US$49.7 million in humanitarian aid to the Contras to be given through February 1990. The December 5 deadline also proved overly optimistic. As the date approached, the Central American leaders again scheduled a summit. The first site selected was Managua. That venue changed to San José, Costa Rica, however, after the discovery of arms in the wreckage of a Nicaraguan aircraft that had crashed in El Salvador. The Salvadoran government subsequently suspended relations with Nicaragua, and an aura of conflict continued to hang over the summit. At one point, Azcona stormed out of a session after Nicaraguan president Ortega refused to drop Nicaragua's International Court of Justice suit against Honduras over the Contras' use of Honduran territory. The Nicaraguan government had previously agreed to drop the suit if the December 5 demobilization deadline were met. As the summit broke up without agreement, the Central American situation once again appeared dangerously unpredictable. The unpredictability of events demonstrated itself once again in the Nicaraguan elections in February 1990. Contrary to most prognostications and opinion polls, opposition candidate Violeta Barrios de Chamorro handily defeated Ortega and the FSLN. Having been forced to hold free elections, the FSLN discovered that many Nicaraguans deeply resented the authoritarian rule of their revolutionary government. The Contra insurgency, which had plagued both Nicaragua and Honduras for years, slowly drew to a close. Although Honduran president Azcona had began the process that eventually culminated in the resolution of the Nicaraguan conflict, another president would occupy the presidential palace as the Contras abandoned their camps in Honduras and marched south. The elections of November 26, 1989, were free of the makeshift electoral procedures that had rendered the 1985 balloting questionable. The PLH and PNH nominated one candidate each, rather than several. Carlos Flores Facusse, a Rodista and protégé of ex-president Suazo Córdova, won the PLH nomination and the right to oppose Rafael Leonardo Callejas, who had also carried the banner of the PNH when he lost in 1985. Callejas's convincing victory, by 50.2 to 44.5 percent, reflected public discontent with the PLH government's failure to translate increased foreign aid into improvements in the domestic economy. Callejas became the first opposition candidate to win an election in Honduras since 1932. All signs indicated that in the early 1990s, Honduras's democratic transition remained on course.